Thanks to Audio Sanctuary in New Malden, London, for once again providing me with their display model of a headphone for in-house review. The build quality of the ADX5000 seems to prioritize its light weight over all else. While not quite utilising flimsy materials, I wouldn’t call it the most robust headphone - it rattles and creaks a little when handled. The headband is an interesting design, although not one that I found entirely suitable for my own use. It kind of sits slightly above your head, no matter how much you adjust it - and it rests awkwardly if you pull it down for a closer fit as it digs into your sides slightly. It’s also covered in fabric that is quite the dust magnet. 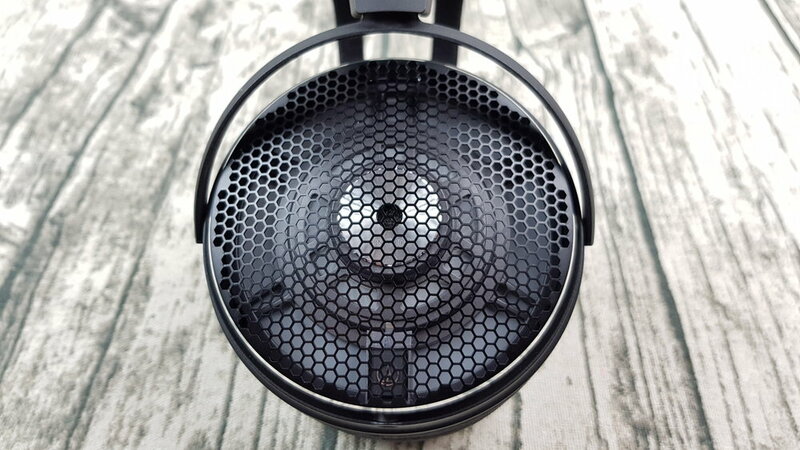 According to the Audio-Technica website, the way they were able to achieve such a light weight was because the “58 mm integrated driver units combine a tungsten-coated diaphragm, baffle and Permendur magnetic circuit in a single unit to reduce unwanted vibration and, since no screw clamps are required, decrease the weight.” I can’t highlight this aspect enough, as this is the lightest pair of full-sized headphones that I’ve reviewed to date. Despite that, the awkwardness of the headband on the sides of my head took away from the experience a bit - but it still overall made my Utopia feel like goliath by comparison. The connectors are A2DC, which stands for Audio Designed Detachable Coaxial. They’re so tiny that they feel more suitable for in-ear monitors, but I understand why they were chosen due to the emphasis on weight reduction. The provided cable itself is 3 metres long and terminated in a ¼ inch plug. I would have liked to have seen a balanced 4-pin XLR cable included as well, as I’m not sure just how easily one can find an aftermarket solution with these connectors. The ADX5000 is a very resolving headphone in the upper-midrange and treble. It has fantastic imaging capabilities and decent staging width. This is in full effect in layered productions, for example the Siamese Dream album by the Smashing Pumpkins because this headphone’s ability to separate the tracks in a mix are highly commendable. Detail retrieval and air are the name of the game with this headphone, and I appreciate it for that. That being said, it was quickly noticeable to me that the bass performance was downright lacking by comparison to the rest of this headphone. While having more weight and body to it than the Sennheiser HD800, it lacks the texture and precision that I thought would be par for the course for a headphone that is attempting to accomplish this level of resolve. Not only that, but it seemed to lag behind a little in transients as well, leading to a plodding sound with several faster rock and metal tracks. I understand that the ADX5000 is tuned with the midrange and treble in mind primarily, but it really was like the bass performance was from another headphone without quite the same capabilities. It also lacks impact and dynamics in this region as well, with the thunderous introduction to Enter Sandman by Metallica feeling a bit thin – in terms of both the drums and the underlying bass guitar feeling muted. 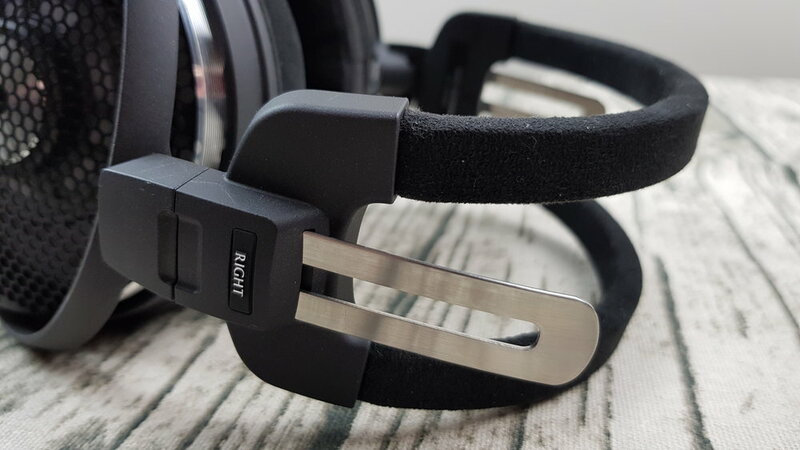 It may sound like I’m quite disappointed here, and initially I may have been, but I reminded myself that not all headphones need to adhere to a certain tuning – nor did they need to give the same priority to a sonic feature. With that in mind, I appreciated the other aspects of this headphone quite quickly. The midrange has a very nice amount of body, an aspect I found sorely lacking on the aforementioned Sennheiser HD800. Listening to the vocal layering in Dreams by Fleetwood Mac was a highly positive experience, for not only did the headphone bring out the nuance of each track – they were presented in a manner I found pleasurably realistic. On the subject of detail retrieval again, it was with this headphone that I heard the second, very subtle, humming (0:11 in) in the introduction for the first time. As the chorus hits and voices pile on with an acoustic guitar, I don’t get the feeling that this headphone is especially lush or even trying to be. It prioritizes a dry, analytical sound – which makes sense to me with just how much it seeks to bring out of a mix. When it comes to instrument timbre on this headphone, I found that it’s very much tied to a few factors. As we’re on the topic of midrange, let’s highlight guitars as an example. I could throw on some early-2000s Nu-Metal, like In The End by Linkin Park and find myself thoroughly stabbed in the ears by thin and unsatisfying guitar work in the chorus. Poorly recorded/mastered songs don’t have a place on this headphone, to me, and will sound harsh and the opposite of a pleasurable listening experience. However, if you take the ADX5000’s analytical nature to a song like The Chain by Fleetwood Mac, you will enjoy every pluck of Lindsey Buckingham’s guitar playing thoroughly. While still slightly on the leaner side than a live acoustic guitar, the headphone’s sparkle and transients made for a very precise and accurate presentation – especially in that part where it rattles a bit. Indeed, the ADX5000 is a very open-sounding headphone and possesses more air than my Focal Utopia, which has better all-around balance, dynamics and impact. The upper-midrange emphasis can be heard from the first few seconds of Nefertiti by Miles Davis, with the trumpet having very nice, air-splitting texture – as it should. I don’t find the highs encumbered on this headphone at all, extension is well in place and not rolled. There is a slight dip somewhere that prevents it from being especially sibilant to me, I’m particularly sensitive to 6k for example, and I found it laid back overall without being too hot or forward in this region. Once again, I will recommend using well recorded and mastered music with this, because all my above praises fall short if you throw some brickwalled guilty pleasure music onto this. Cymbal work is especially impressive, darting from side to side as a result of this headphone’s imaging capabilities while maintaining the full amount of emphasis needed to not sound thin or rolled off in any sense. A bell cymbal sounds like a bell cymbal, and a crash sounds as full as it should. Indeed, it seems my complaints about the bass performance not being impactful enough did not quite extend to the treble region. My one nitpick with the treble, however, is that it seems slightly unclear sometimes. It’s as if there’s a tiny amount of film on the recording, one that disappears if I switch to my Utopia. I’m not sure how this came to be, but all the detail retrieval capabilities that this headphone possesses might not mean much to you if you hear this and are fixated on having the lowest noise floor possible in your listening experience. I did swap out several different tubes, and tried this on my solid state amplifier (a worse experience, I do recommend some nice detail-emphasized tubes for this) but I still felt this sensation. Overall I do quite like this headphone – but I wouldn’t want it as my daily driver. 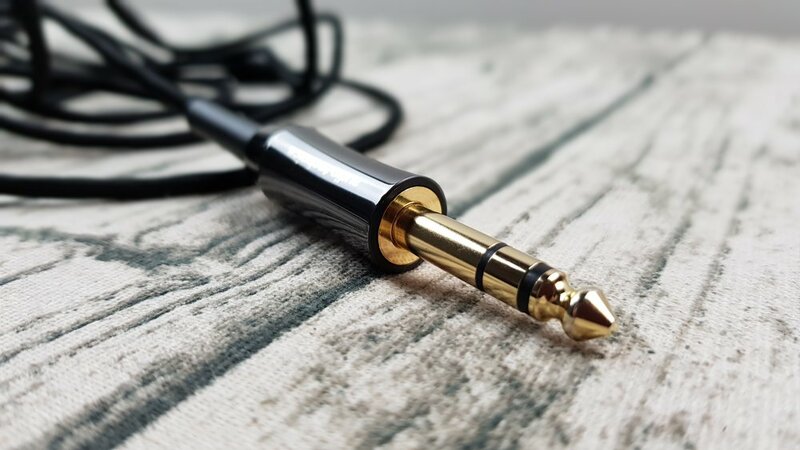 Like some headphones that I’ve reviewed in the past, I can personally only really see it as a flavour can as my musical taste is so varied that I can’t only pair this with genres that gel well with it – jazz, classic rock, classical, female vocals etc. To date, it’s been the headphone to most take advantage of my reference source chain in terms of detail retrieval. A thought that often crept into my mind while listening, however, was that this headphone reminds me a lot of balanced armature in-ear monitors. My limited experience with them has taught me that they can really bring out the finer details in a mix, but the bass is sometimes a bit disappointing compared to dynamic-driver bass – to me anyway. While the ADX5000’s staging width is clearly superior to the Utopia, I struggled when it came to evaluating imaging prowess and depth between the two. I honestly feel they go neck-and-neck, which is impressive considering the MSRP difference. Where the Utopia is the clear winner, however, is with its near-electrostatic level speed, thunderous impact and all-around dynamic sound. By comparison, the ADX5000 feels thin and slightly subdued, especially with some genres that call for some bombast. The Utopia also has more focused bass; textured, precise and fast in transient response. The ADX5000, while having the fullness and volume in this region that the Sennheiser HD800 might lack, misses all these marks quite a bit. My initial surprise at its bass performance gave away to being impressed with the rest of it, but I still do find it to be rather unsatisfying in this region. The Utopia’s midrange has bit more body to it, especially in the lower-midrange, than the ADX5000. This leads to more crunch with distorted electric guitars and slightly more woody bloom with acoustics. That being said, and while the Utopia has fantastic detail-retrieval, I feel that this aspect might slightly mask its ability to pull as much out of a mix as the ADX5000. The Audio-Technica flagship is the first dynamic-driver headphone that I’ve heard that slightly edges the Utopia out in this regard – it’s actually more analytical. What the Utopia does have is more clarity, relating to what I said earlier about the treble on the ADX5000 being slightly grainy. I’ve heard people complain the the beryllium driver of the Utopia might sound too cold and steely before, but I do prefer that to a slight graininess personally. To go along with its wider soundstage, the ADX5000 is also the more “open” sounding of the two headphones. It has airiness, and while neither headphone has a roof of sorts – it just seems to go further with its presentation. It’s also less forgiving than the Utopia, which itself isn’t very forgiving – as the ADX5000 can sound absolutely shrill from poor recordings rather than just harsh like on the Focal. At 420 ohms, this required slightly more volume on my Dragon Inspire IHA-1 tube amplifier than other dynamic-driver headphones I’ve tried with it, but it wasn’t at an unheard of setting regardless. I did find that slightly smoother tubes rounded off the highs a bit on the ADX5000 to a level I preferred. Out of my Audio-GD NFB-28, I found the bass to be fuller but still lacking texture and impact. The detail retrieval aspect of the headphone was still impressive, but muted slightly due to the amp’s dampened-sounding nature. While my concerns of this headphone make it so I wouldn’t want one personally, I really do see how it can be a great fit for someone who wants a dry, analytical and airy sound in their headphone. The ADX5000’s ability to separate a mix is its main selling point, as the detail retrieval slightly edges out the Focal Utopia. If you prioritise the genres that this headphone works well with, I do believe that you would enjoy it a lot.